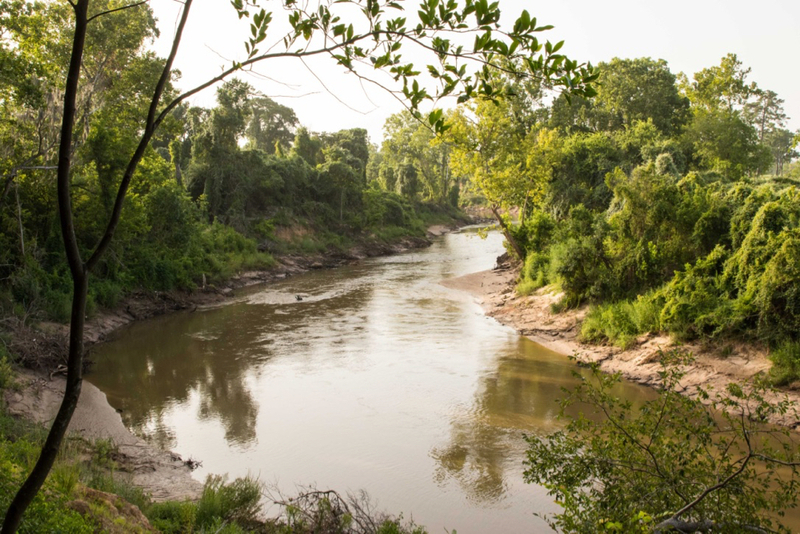 How Old Is Buffalo Bayou? Where Does It Come From? 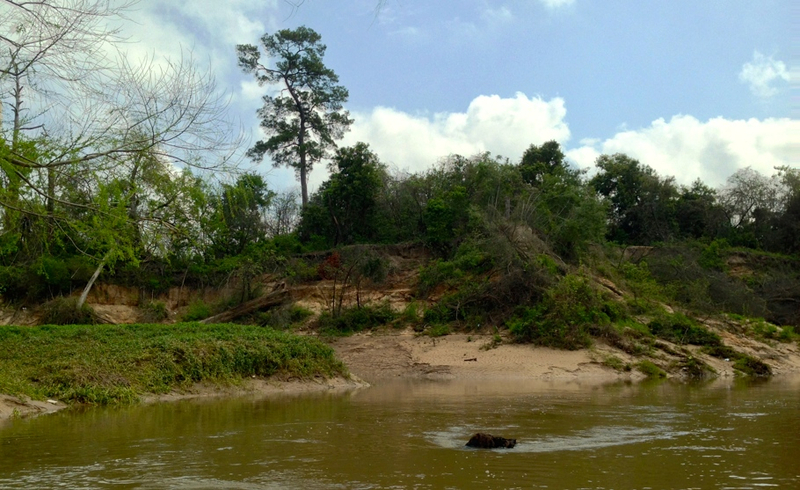 Want to learn about the geology and natural history of Buffalo Bayou? 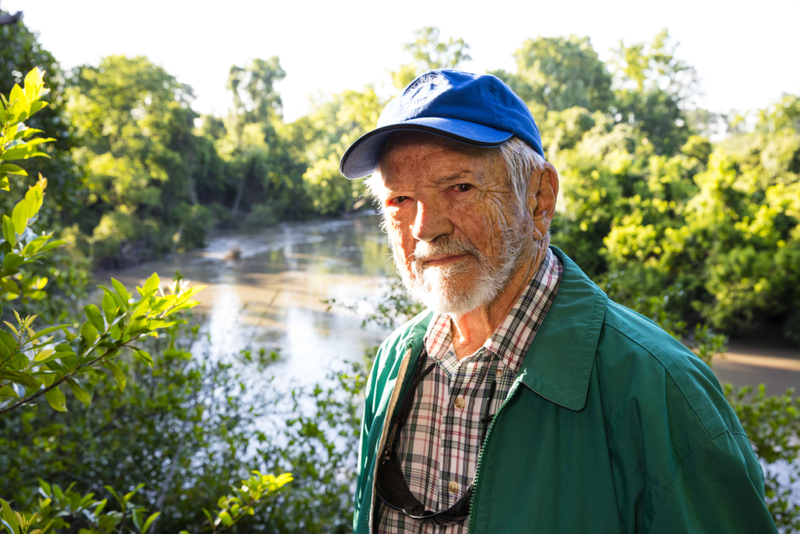 Save Buffalo Bayou is partnering with professional geologist Tom Helm, who also happens to be an outstanding naturalist and river guide, to offer floating classes on the geology of our 18,000-year-old mother bayou. 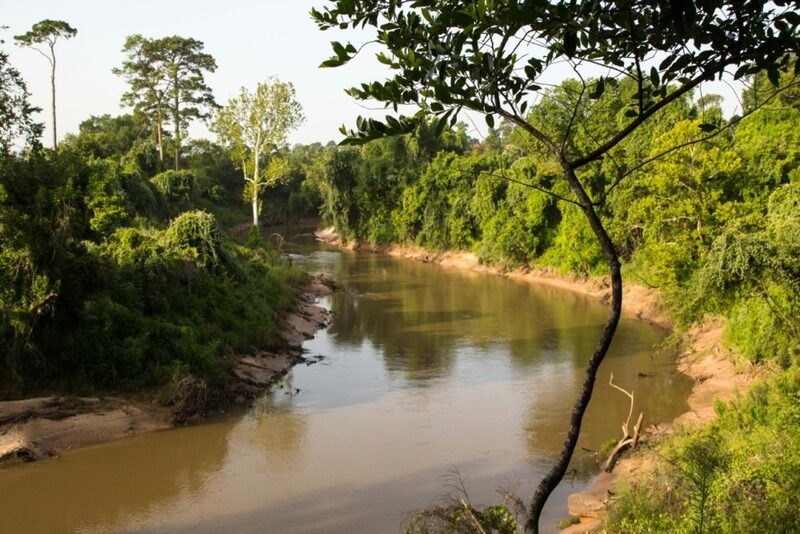 Paddle with Tom on a two-hour canoe trip down Buffalo Bayou and see some of our Pleistocene natural history right here in the middle of Houston. Learn all about the formation of the bluffs and sandstone rocks during the last ice age. 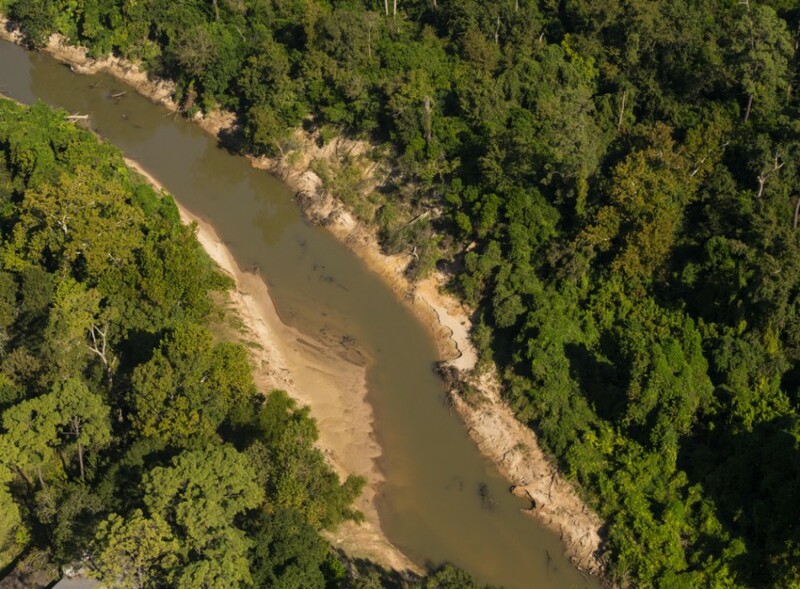 See examples of depositional environments and fluvial processes. 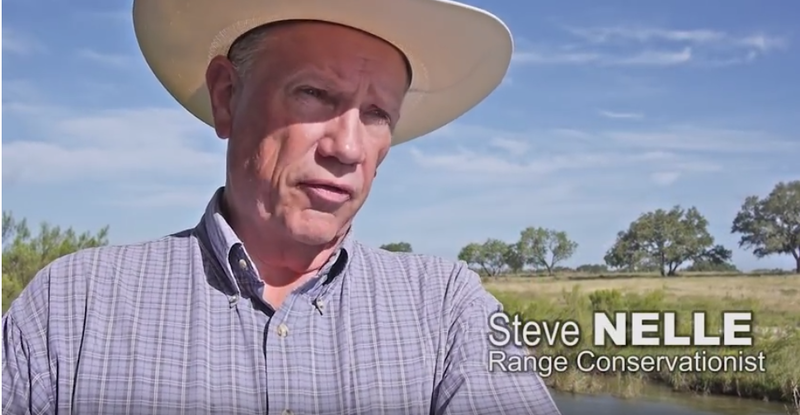 Find out why the banks are sandy and how sand moves downstream, why the river looks the way it does, and much more. 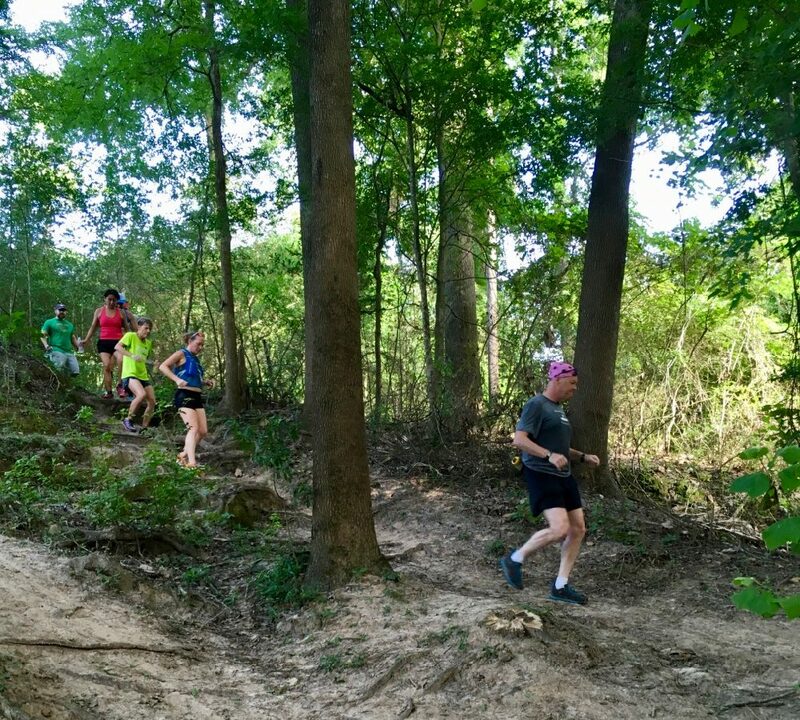 The classes start at the Woodway boat launch in Memorial Park and float past the park and the Hogg Bird Sanctuary, through the historic natural area targeted for destruction by the Harris County Flood Control District. Multiple stops will be made along the way to examine features of interest. The schedule depends on class size. One to four persons can be scheduled any day of the week, usually with no more than 48 hours’ notice. Groups larger than four persons (up to 30 persons maximum) are accepted only on weekends. These larger weekend groups need to schedule at least one month in advance. Cost is $50 per person, which includes canoe and equipment, and light refreshments at the end. Discounts are available for academic faculty and students. 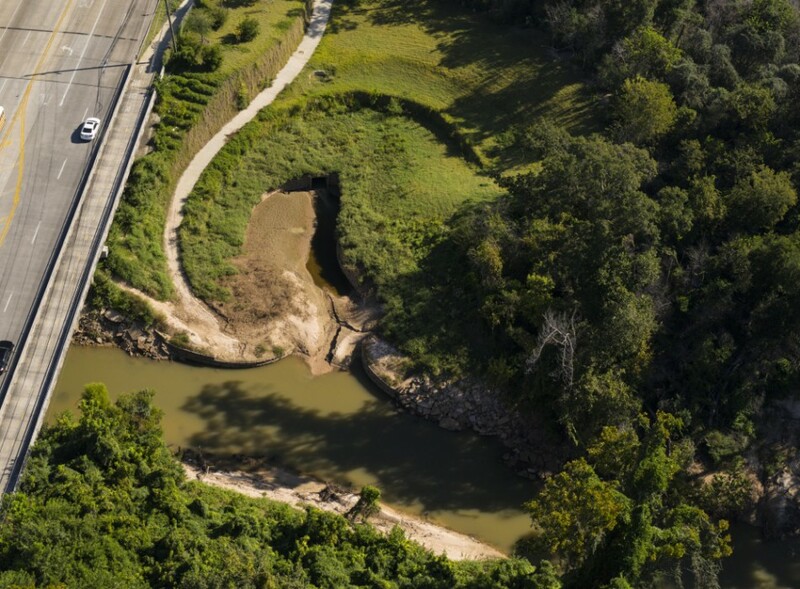 Note that the classes will be not take place if the flow of Buffalo Bayou is greater than 300 cubic feet per second (as measured by the Piney Point USGS gauge). At water levels above this, the sandstones are mostly obscured. If a trip is cancelled due to high water, students have the option of rescheduling or receiving a full refund. For more information, contact Tom Helm. 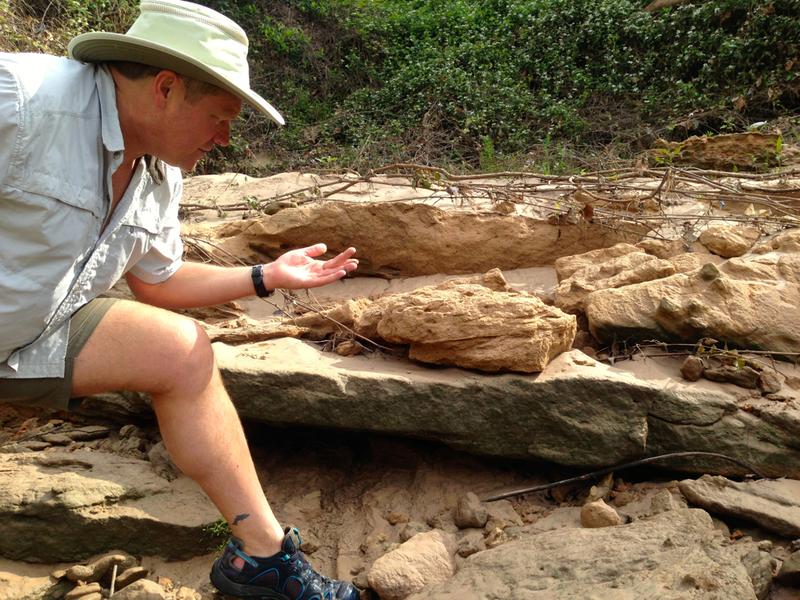 We floated with Tom recently for a preview of the geology class. Among the things we learned is why some of the mud stinks. 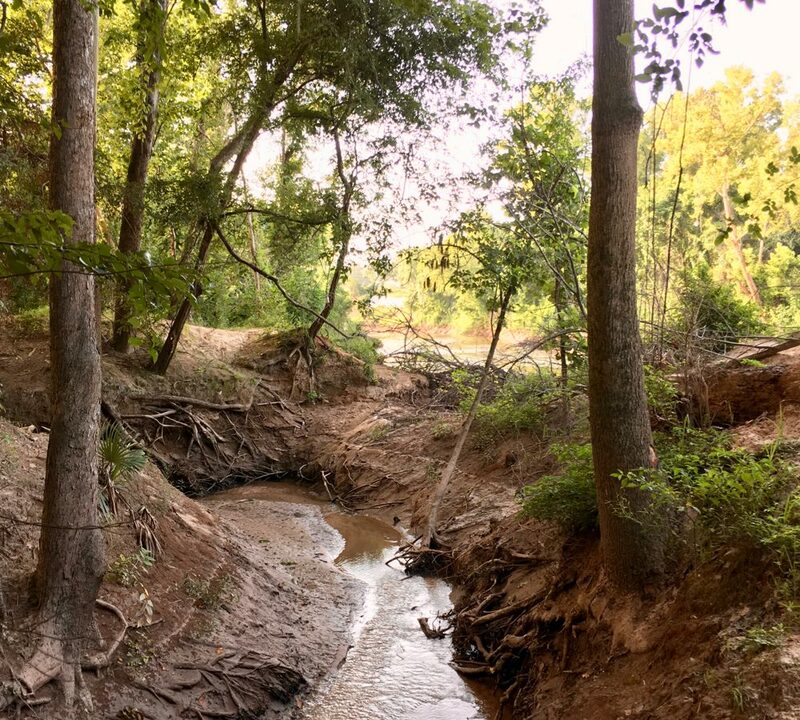 The mud and the sand are filled with layers of organic matter, leaves mostly, and as the organic matter decomposes, it smells like … decomposing stuff. 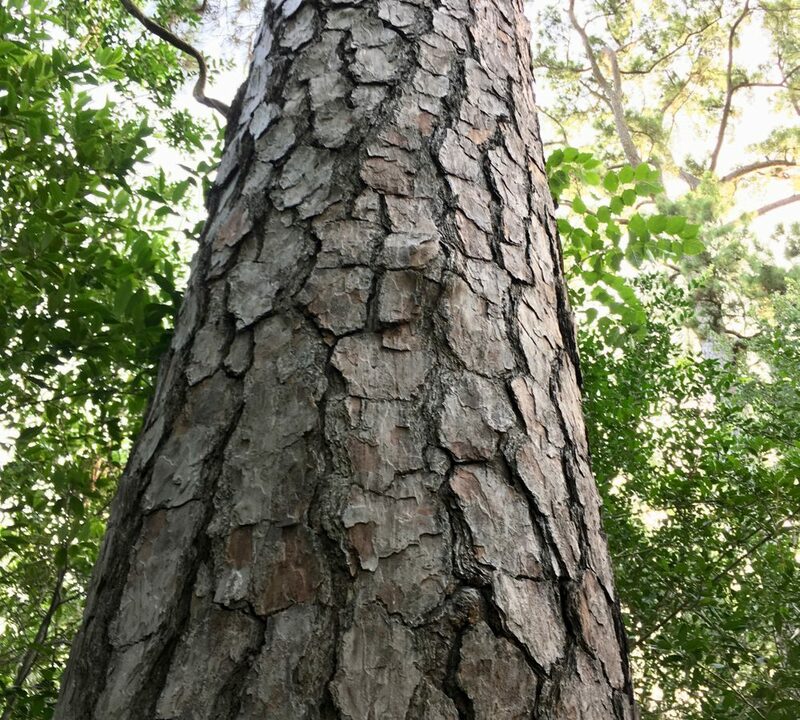 But it also builds soil for future vegetation. This process produces the mysterious oily sheen that you see floating on top of the mud sometimes. We also learned to tell mud from sand from silt. (Hint: it’s a matter of the size of the grains.) Tom showed us how geologists rub the mud between their thumb and fingers to feel the size of the grains. We studied the patterns in the sand, watched the grains of sand moving in the water, and learned about eddies and sediment deposition and transport. We saw a lot of animal tracks. 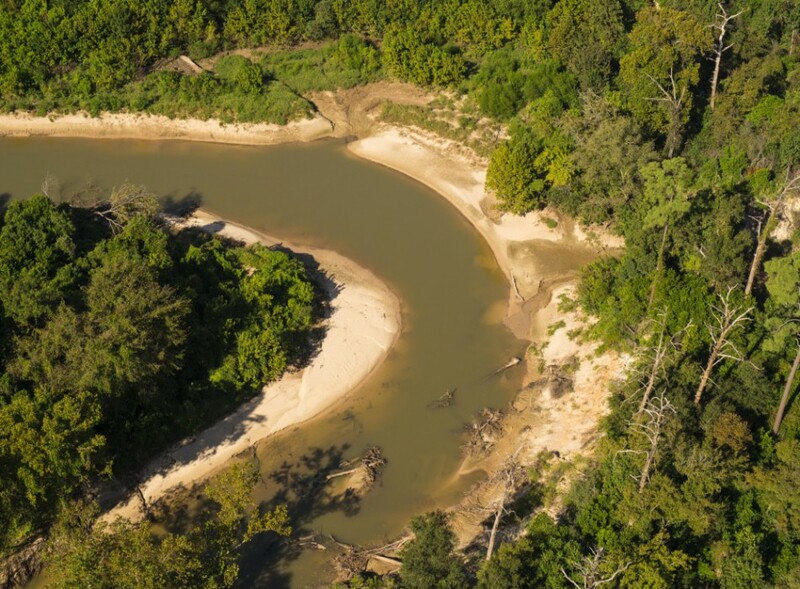 We learned to put the constantly changing bayou in the context of its natural process. 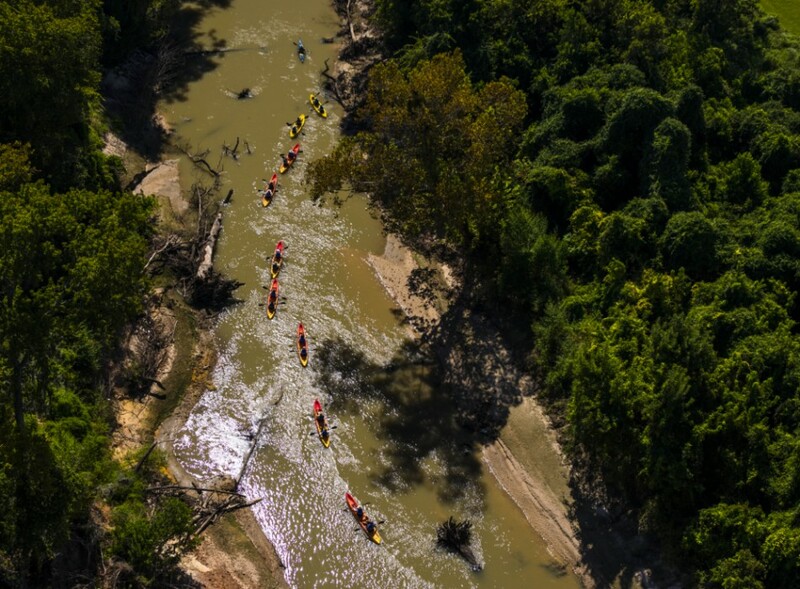 Okay, so we harshed the mood a little with our small, silent reminders that regatta contestants were paddling through a historic natural area still threatened with destruction. 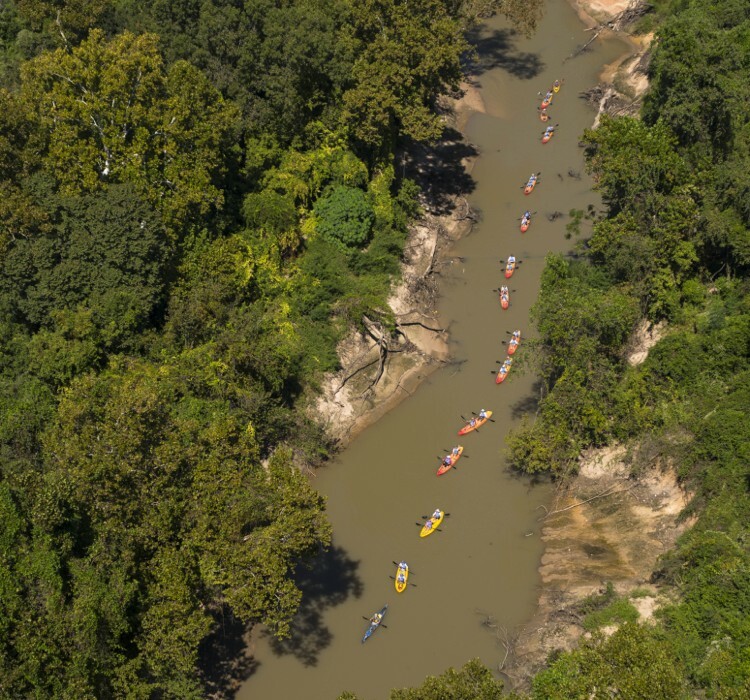 “Thanks for polluting my day,” yelled one paddler in the crowd of hundreds of Buffalo Bayou boaters playing loud music and stopping to pee in the woods. 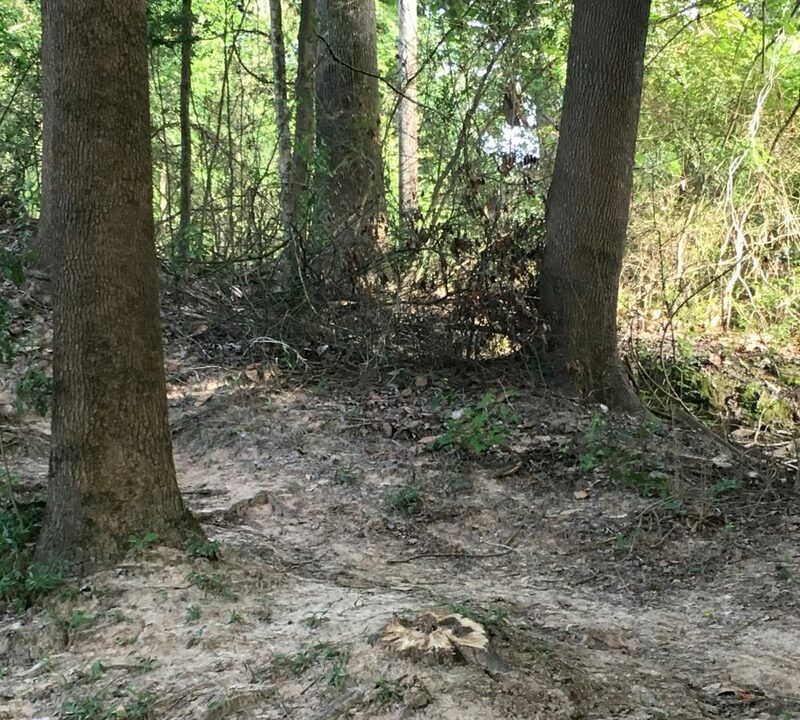 We were watching from the sandy bank of the lovely middle meander, forested with young willows and box elder that would all be cut down, the meander filled, graded, and planted with grass. 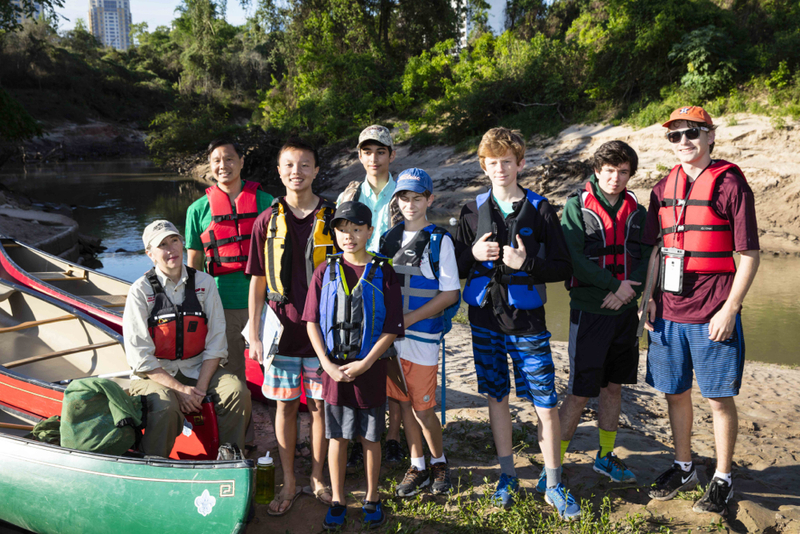 The event was the 44th Annual Buffalo Bayou Regatta on Saturday, March 12. 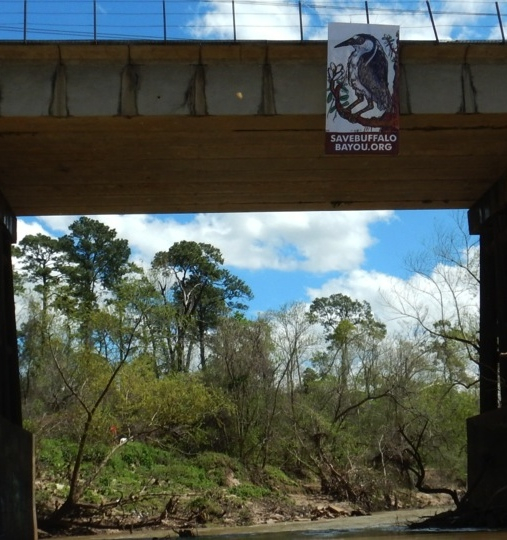 And once again we hung our beautiful Save Buffalo Bayou banner (Night Heron by Houston artist Frank X. Tolbert 2) from the railroad bridge and set out small white signs alerting participants to the fact that the wild stretch they were passing through would all be bulldozed under a plan proposed by the Harris County Flood Control District and the Bayou Preservation Association (BPA). Save Buffalo Bayou banner hanging from the railroad trestle crossing Buffalo Bayou from Memorial Park. Photo March 12, 2016, by Richard Hyde. The project, known as the Memorial Park Demonstration Project, demonstrates exactly the wrong thing to do. 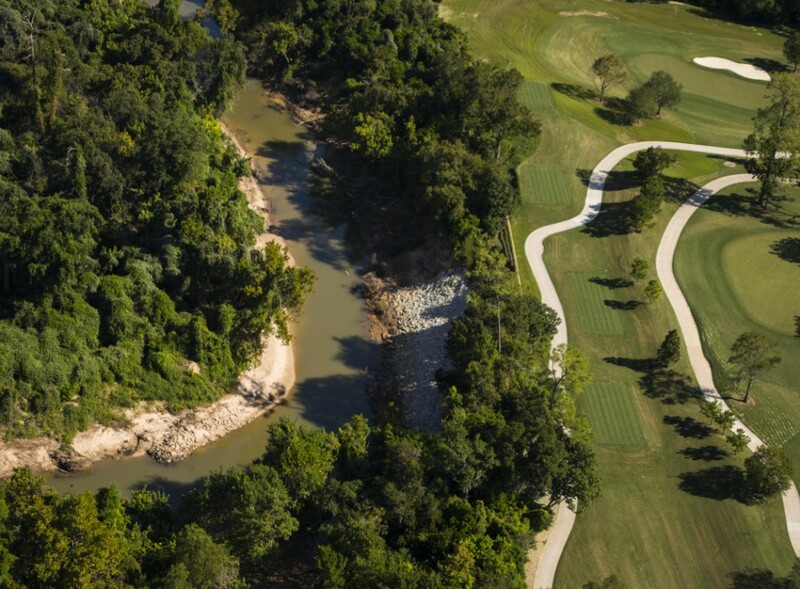 (See Buffalo Bayou Park and Fonteno Park.) 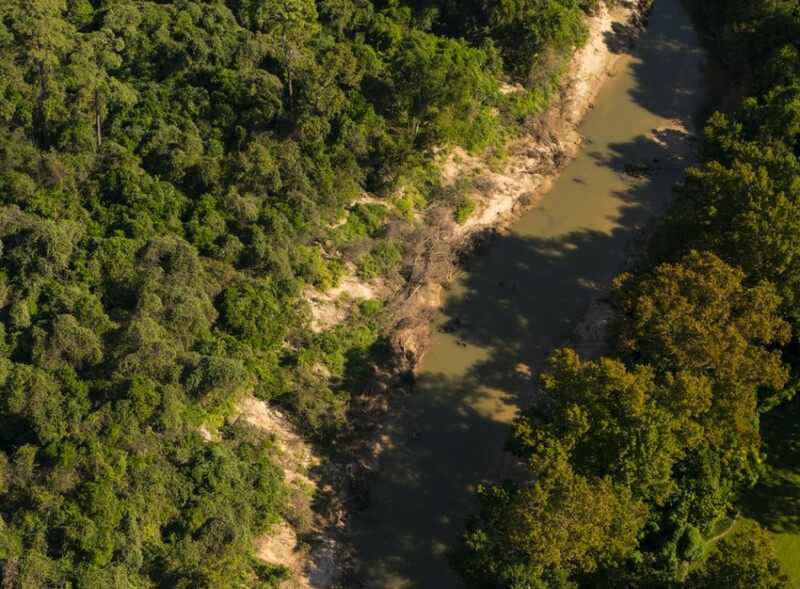 It would raze most of the trees and vegetation along more than 1.25 miles of the 18,000-year-old bayou as it passes by Memorial Park and the Hogg Bird Sanctuary. 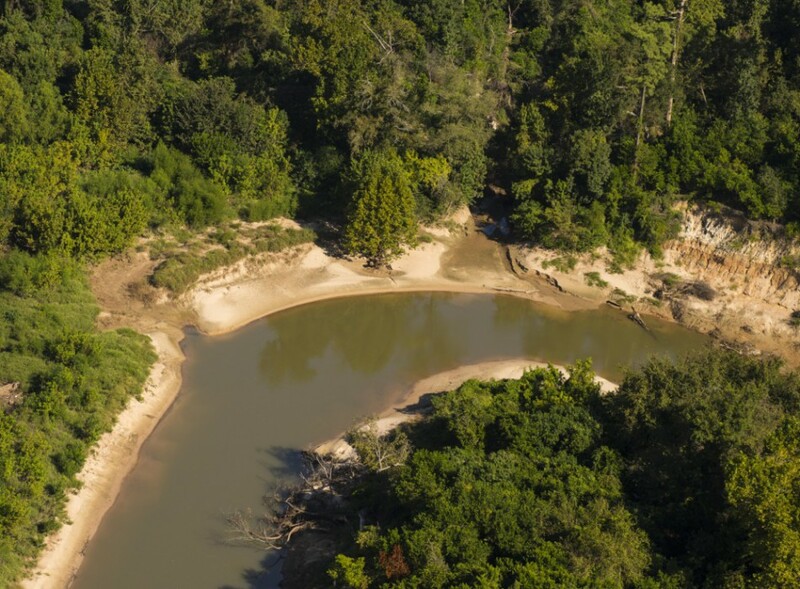 These trees and vegetation and even the sand are part of the riparian zone, essentially wetlands, that hold the banks together, cleanse and filter the water, slow and absorb storm runoff, provide wildlife habitat, among many other important ecological functions. 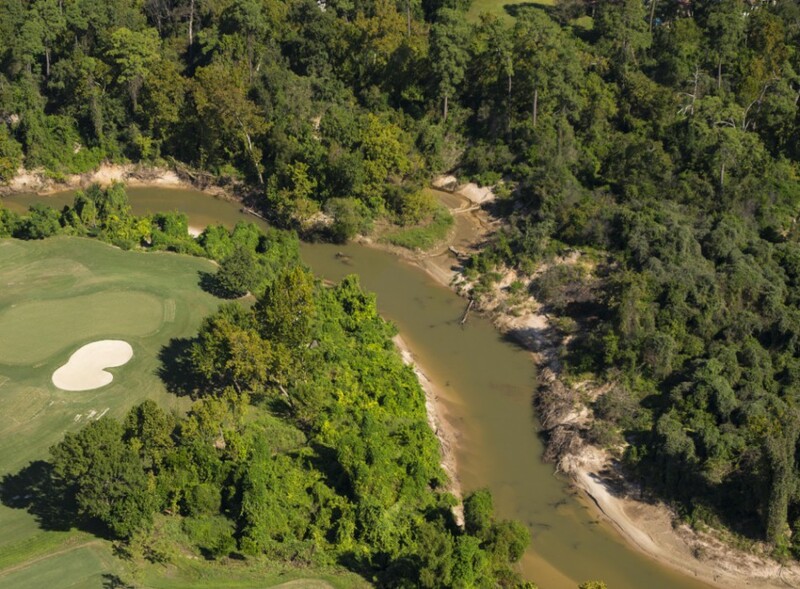 The $6 million “natural channel design” project, financed with $4 million in county and city taxpayer funds, would dredge and reroute the bayou and plug tributaries, obliterate ancient cliffs, destroy 250,000-year-old sandstone formations, and fill in our lovely meander (a natural detention area). 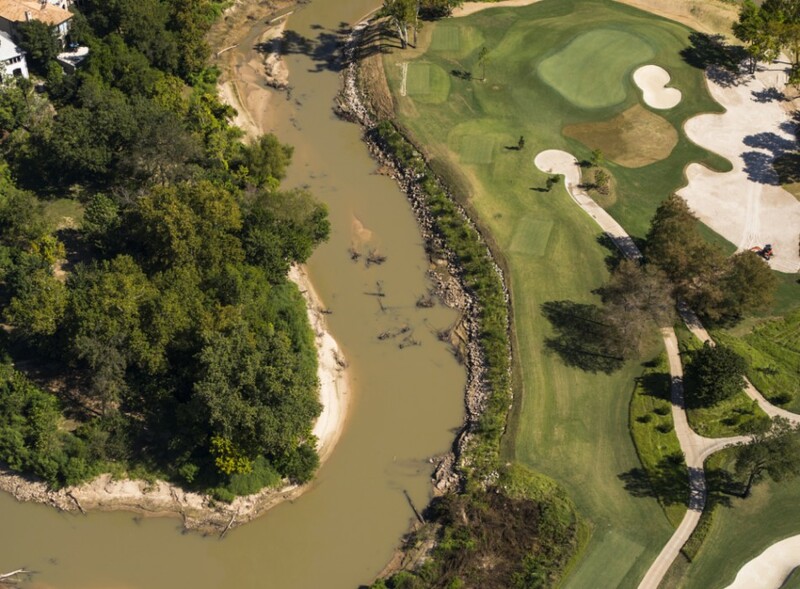 Killing the bayou’s ecosystem in the name of “restoration.” And landscape design. And no, contrary to rumors, the project, although holding its breath, is not dead. 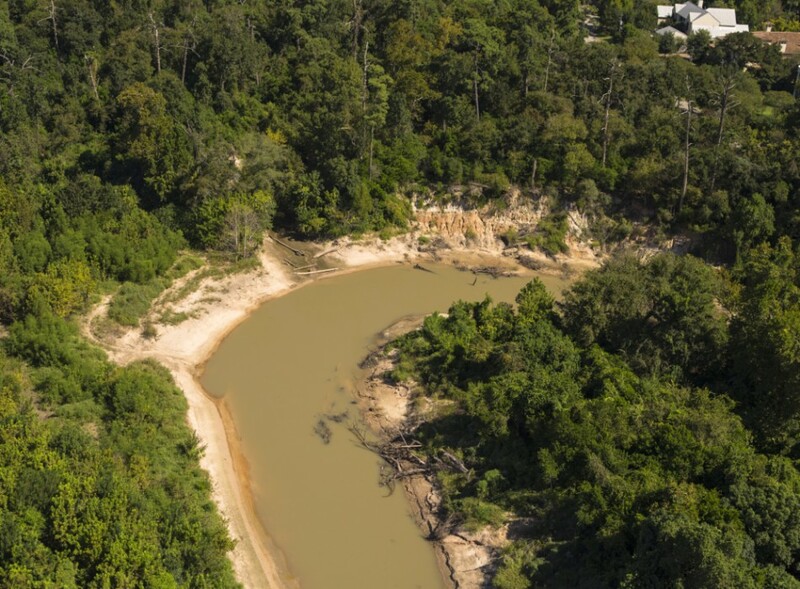 The Army Corps of Engineers is still deciding whether to issue a permit for the project, which is otherwise a violation of the federal Clean Water Act. 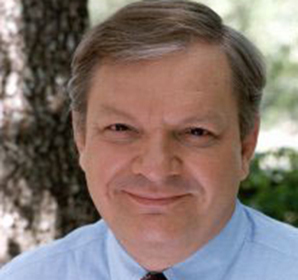 The Bayou Preservation Association first formulated the plan for the project in private meetings in 2010 and former BPA president Kevin Shanley, then a principal with the landscape architecture firm SWA Group, was the primary promoter. 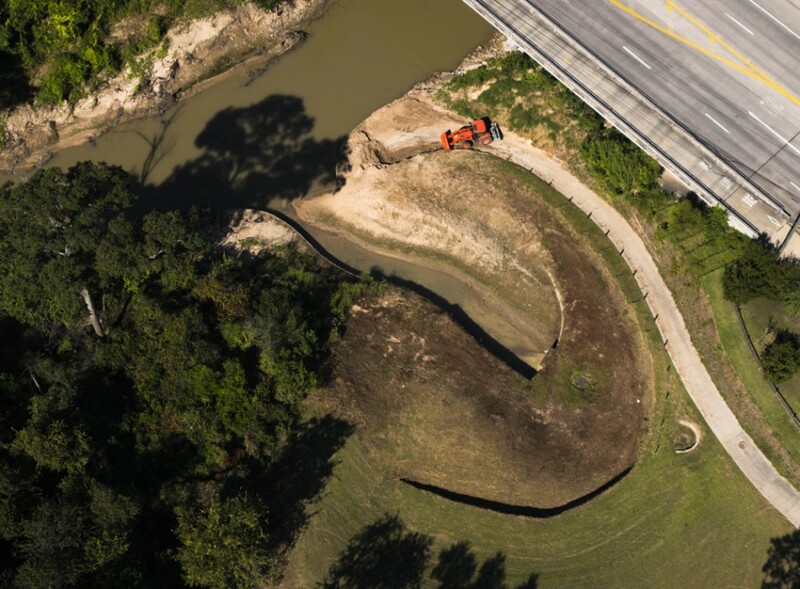 SWA Group is the design firm that is also responsible for the landscape design of Buffalo Bayou Park downstream east of Shepherd. So this is why we had signs up warning of landscapers lurking. 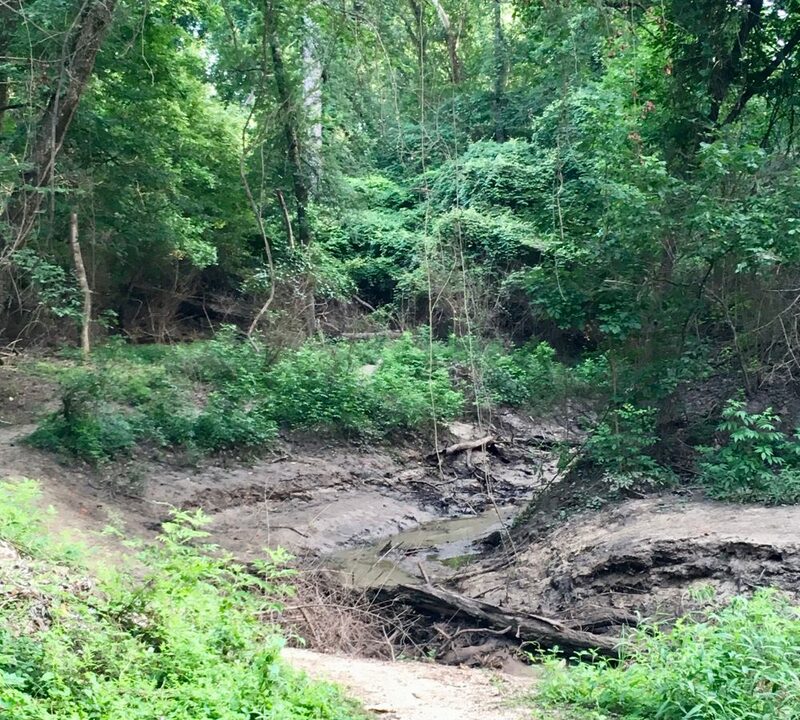 In Buffalo Bayou Park downstream, we set out a few signs pointing out that landscaping has washed away (several times actually) and that removal of vegetation has caused erosion problems, and that repairs were $$$$ (paid with City funds). Yes, we were bad! Those signs did not last long, however. 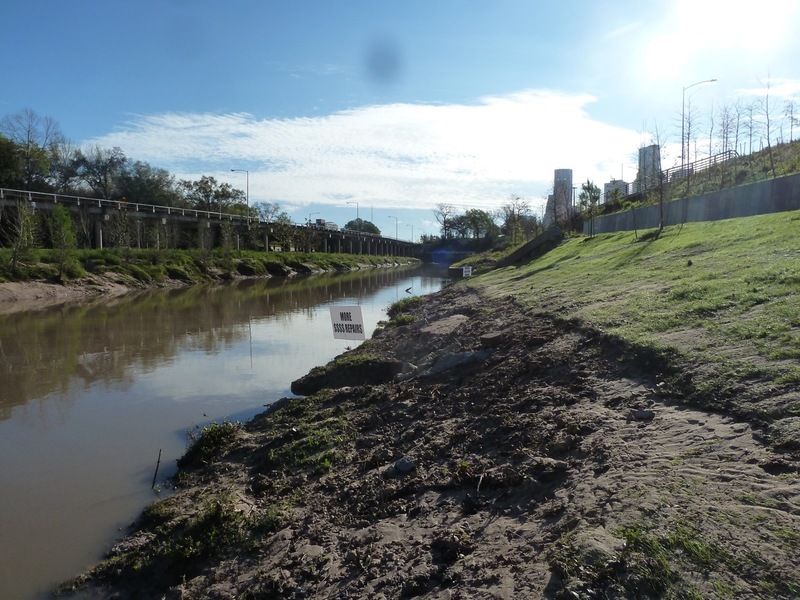 Educational signs posted on expensive repairs to eroding banks that previously had been “stabilized” by the Harris County Flood Control District in Buffalo Bayou Park. Photo March 12, 2016, by AC Conrad. 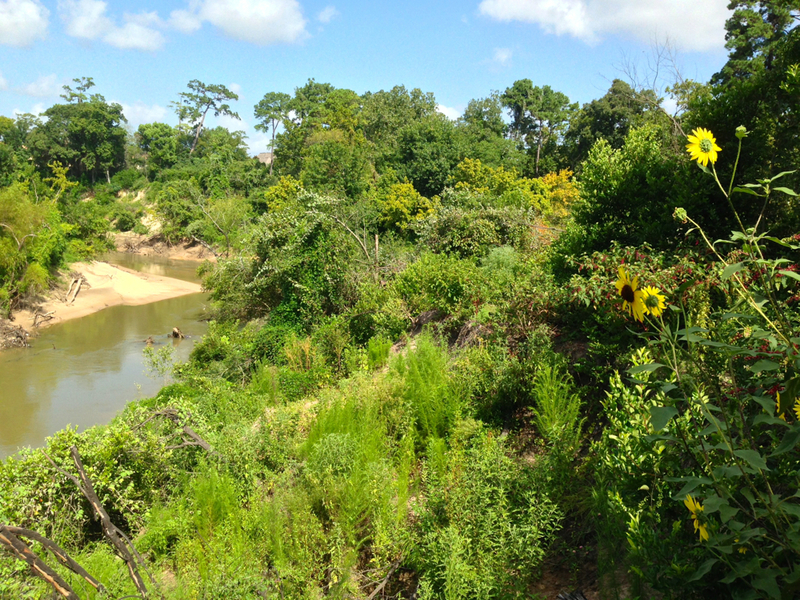 Upstream around Memorial Park and the Hogg Bird Sanctuary our signs pointed out where beavers live, where banks were being naturally rebuilt by the bayou, and the Pleistocene bluffs that would be graded into a slope. 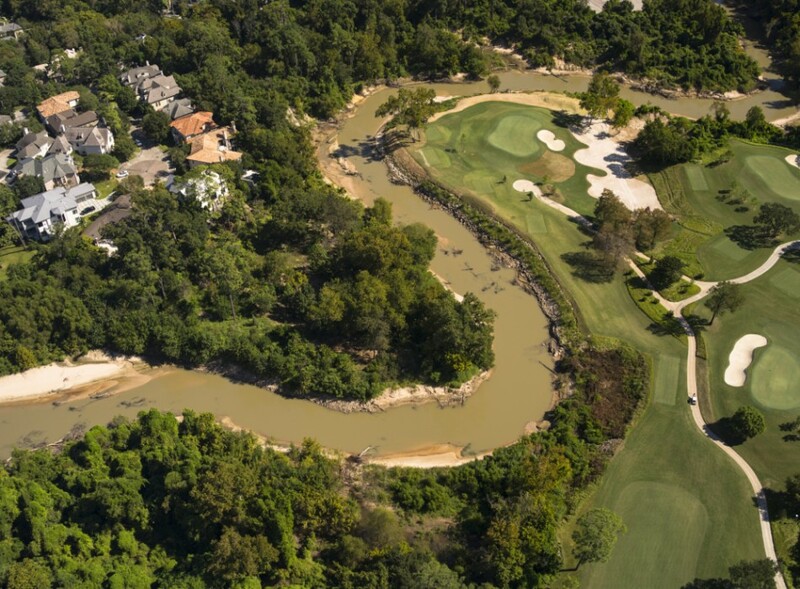 Interestingly, the bayou, during and after the Memorial Day flood in 2015, has already graded the lower banks of those steep bluffs into a slope. 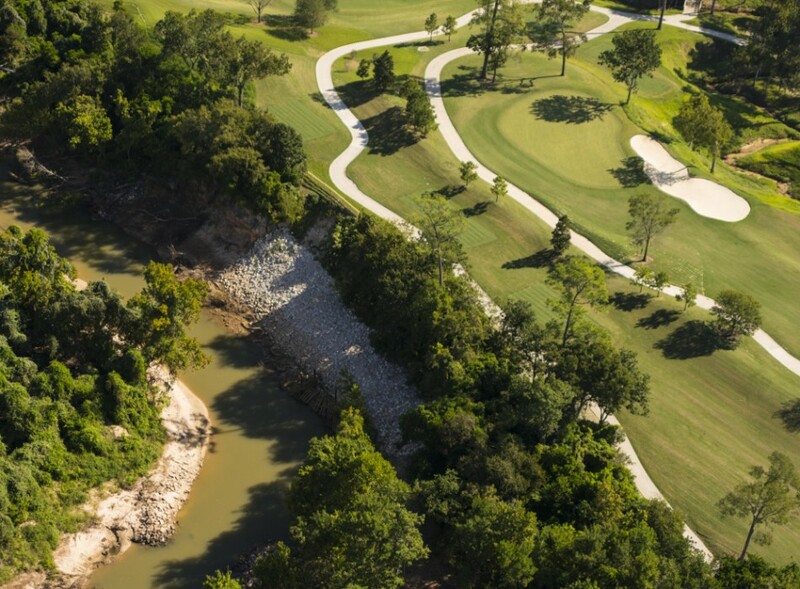 The River Oaks Country Club is theoretically a one-third partner in the demonstration project and owns the entire south half of the project reach. 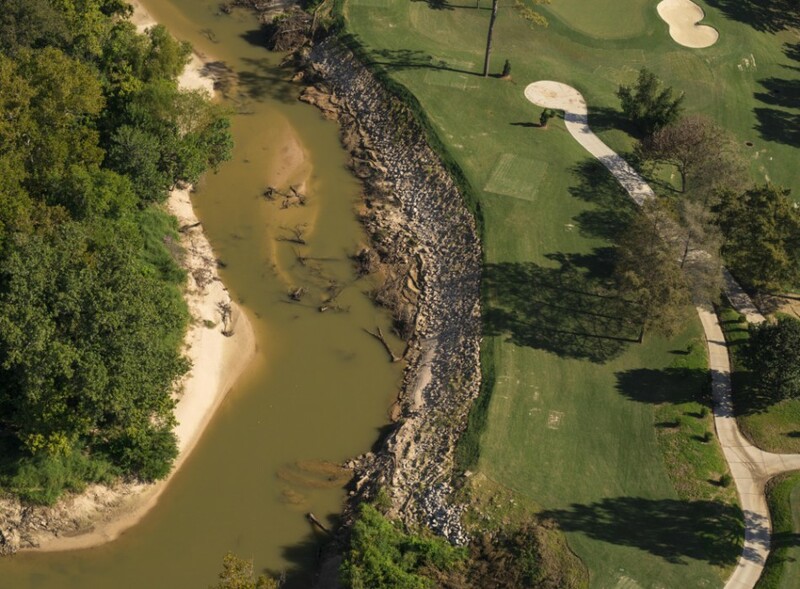 But in the meantime the club in two places has armored its banks with ugly concrete riprap, one of the most environmentally destructive methods of erosion control (pdf), and also, we allege, in this case illegal, as we contend that much of the riprap was placed in public waters, also a violation of the Clean Water Act. 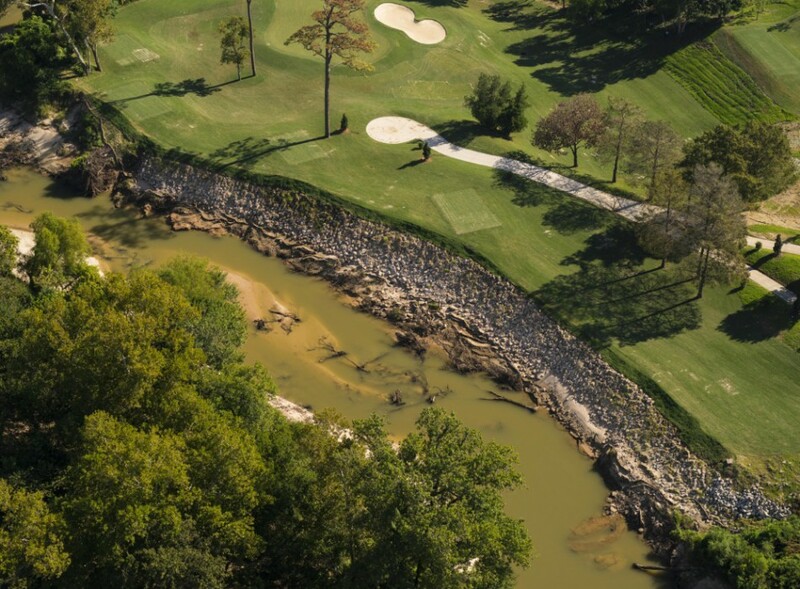 The club, unfortunately, is having erosion problems on its high banks in those places because it cut down a lot of trees and extended the mowed and watered grass of its golf course up to the edge of the banks. We put out signs pointing out that riprap damages the ecosystem and is part of the problem, not the solution. But we’re glad people had fun, enjoyed the bayou, and picked up some of trash. Maybe they’ll think about the future of the bayou. And special thanks to river guide Tom Helm and to Richard Hyde for extra long duty putting out and picking up our banner and picking up our signs.